The view from former President George W. Bush's chair in the Situation Room of the White House, Washington, May 2007. These are the realities that President-elect Donald Trump will encounter when he enters the Oval Office. In building his national security team and designing his decision-making processes, he now has the opportunity to learn from those who have come before him, avoid their mistakes, and adopt their best practices. Before President Trump takes office, Washington will be papered over with studies such as this one advising him on how to best organize his national security team.1 Many of these reports’ recommendations will be somewhat redundant, which may cause some to wonder whether this field needs yet more tilling. We believe it does. The similarities in recommendations across numerous expert studies are an indication that many practices in recent decades—across administrations of both political stripes—are generally considered by experienced policymakers to be inadequate to the demands of sound national security policymaking. Some suboptimal practices have been particular to specific administrations and presidential personalities, while others have been the result of a slow accretion of behavior patterns that transfer from one administration to another, even across party lines. As a direct result, America’s national security decisions and their execution have too often underperformed. Process matters. Effective decision-making processes can go a long way toward facilitating successful national security policies, and dysfunctional processes can be the undoing of the best-intentioned plans and objectives. The importance of process is often underestimated by national security analysts who have not previously been policymakers themselves. It starts at the top. Unfortunately, most U.S. presidents in the modern era have been elected into office without deeply considering what processes might ideally integrate both their own personal preferences and the inherent needs of the large, complicated national security institutions that they will soon lead. Most incoming presidents have thus been forced to learn on the job and have adjusted their administrations’ processes accordingly over time. It would be preferable, of course, for the next president to avoid this steep learning curve. And given the wide range of national security challenges that are likely to confront President-elect Trump in the first year of his administration, the cost to the nation of a too-steep learning curve may turn out to be unacceptably high. Our aim with this report is to help the incoming administration avoid this risk. This report seeks to help the incoming president and his transition team identify choices that are often not deliberately made but are crucial to a well-functioning interagency process that provides information and tees up decisions in ways that support the president’s management style, rather than becoming an impediment to the president. The authors engaged with a wide range of high-level practitioners to determine best practices for making national security policy—including Stephen Hadley, Susan Rice, George Shultz, Madeleine Albright, and Henry Kissinger—and quote their comments at length. In our judgment, hearing the voices of the practitioners was the most valuable way to convey their lessons. From these wide-ranging interviews emerged a general consensus on what steps President-elect Trump—or any future president in the decades to come—should undertake to demand processes that better inform policy choices and allow his or her decisions to be carried out more faithfully. While each modern administration has had its own sets of experiences and circumstances, its own moments of dysfunction, and its own comparative advantages in its national security decision-making processes, the degree of unanimity among the former leaders across these administrations is notable indeed. More voices help convey the urgency of improvement. And while many recommendations are indeed similar, they are not all identical; where and why they differ is itself interesting and can inform an incoming administration looking for structural or procedural ways to improve government’s performance. At the same time, it is all too easy to stipulate how an administration should be organized without factoring in the specific politics and personalities, the long-standing feuds and friendships, the excess or dearth of talent for positions, the competing priorities, the international crises, and the other urgent problems that will not wait on an administration to take shape. What strategist Carl von Clausewitz said of warfare is also true of national security policy: “Everything is simple, but the simple is exceptionally difficult.”2 Running the national security policy process is a demanding job, more often done poorly than well due to the sheer degree of difficulty. The most important conclusion of this report came from Stephen J. Hadley, President George W. Bush’s second national security advisor, which we call Hadley’s Dictum: “Presidents get the national security process they deserve.” The president’s role is so determinative and personal influence is so all-encompassing that responsibility cannot rest anywhere else. His or her personality, personnel choices, the administrative routines they establish—whether by active management or simple default—overwhelm all other factors. The seminal advice from this report is that while there are better and worse ways to structure policymaking and execution, the optimal choices for any administration are those that work with the grain of the president’s management style. Textbook practices at stark odds with how the president is comfortable making decisions will result in circumvention of the formal decision-making process until practices are found that suit the president’s needs. As Henry Kissinger has noted, it is theoretically better to use the Brent Scowcroft model of the National Security Council, or NSC, as honest broker, but most national security advisors and their staffs nonetheless become part of the debate. Many presidents have tended to have their immediate, in-house staff—the NSC staff—handle the most sensitive issues and negotiations because they are the most personally trusted, tend to have the greatest knowledge of and commitment to the president’s agenda, and are least likely to engage in leaks to the media and Congress hostile to the president’s leanings before a policy takes shape. It takes an enormous amount of trust and unusually effective enforcers of the process for the interagency to work as the Dwight Eisenhower and George H.W. Bush administrations did. Nobody can do more to build such a culture of trust within an administration, or by action or inaction proliferate a culture of distrust, as can the president. Moreover, if a president cannot extricate himself from tactical decisions—either because it is the natural level of his engagement or because he prefers to reason from the tactical to the strategic—it unfortunately makes little sense to organize NSC meetings to decide strategic-level issues. The process must fit the president, not vice versa. While researching this report, we were struck by how many crucial decisions about the process of policymaking on national security issues were the result of drift rather than deliberate decision. And as Condoleezza Rice has emphasized, opening the aperture for consideration of alternatives is a challenge once policy has been set. Presidents very often carried over practices and people from campaigns without conscious choices about whether those individuals would be suited to supporting the demands of the nation’s highest office. And yet all too often, they have found that the processes for organizing information and framing decisions that have served them so well in other circumstances, even in other executive leadership positions, are not always directly transferrable to the presidency. It is our firm belief that this report can best contribute to the next administration by properly framing the questions that will most advantage the incoming president and his transition team as they are considering the staffing and workings of a national security team. With an in-depth understanding of the president and how he wants his administration to function, transition teams can make recommendations best suited to a well-functioning interagency that works with the president’s management style rather than struggling against it. This report concludes with a relatively long section on best practices that quotes many of the interviewees on subjects that they repeatedly raised. We guided the process by posing questions but had no preconceived notions of what should be done differently: Our methodology has been to read widely of history and memoir and ask top policymakers to share their experiences and thinking about how to improve the processes to better serve the president, irrespective of who that is or their policies. Our analytic approach has been a devotion to economist Tyler Cowen’s first law, which stipulates that there is “something wrong with everything.”3 The authors sought to explain what is difficult or demanding in every approach recommended so that transition teams will have a catalogue of pros and cons associated with different approaches and can best optimize their practices. In producing this report, we have been rigorously bipartisan, not only in the composition of our research team from both the Center for American Progress and the Hoover Institution but also in the people we interviewed. The research base consisted of former national security advisors, Cabinet members, deputies, and assistant secretaries and senior staffers regarded as especially attentive to structural and procedural issues. The authors have particularly sought the views of individuals who have routinely participated in Principals and Deputies Committee meetings across multiple administrations, both Republican and Democratic, at the White House and within the executive departments. Lengthy interviews were conducted by the authors over the past year, typically in person in the interviewees’ offices. Those interviews were recorded and transcribed, and interviewees were offered opportunities to review those transcripts and clarify their intent so that we could ensure we were reflecting their views accurately. Unless otherwise noted, all the quotes cited in this report come from those interviews. A detailed list of those interviewed is included in Appendix A. The first scheduled interview for this project was with Sandy Berger, who served as national security advisor in the second term of the Clinton administration and as the deputy national security advisor in the first. Sadly, Berger died a few days before we were to have sat down with him. He had strongly encouraged that this report be written, stressing how important good process was to good policy. He particularly liked our approach of letting people who have held these demanding jobs explain what worked and what did not in the time of their responsibility. Berger actively guided our preparations and the types of questions we planned to ask interviewees. We sincerely hope he would approve of the result, which is dedicated to him. Presidents often underestimate how important it is to get the process of policymaking right. Other than Dwight Eisenhower, no modern president has ever entered office having run an organization as large and complex as the federal government. Indeed, many have never run anything larger than a congressional staff office. Those assuming the presidency have likely never reported to a board of directors as divisive as the U.S. Congress nor had customers as diverse, demanding, and opinionated as the American public. They have experienced the media scrutiny that comes with running for president, yet they are often surprised that it is possible for the intensity to increase even further once in office. Most presidents have never had to make life and death decisions before, nor were they responsible for precedents that would reshape international practice or materially affect the world’s largest economy. There may be no genuine preparation adequate for the job. Still, it is a fact that most presidents have dramatically overestimated their ability to put their personal stamp on the working of the executive branch. This is nowhere more true than in national security policy. The development of many of the essential U.S. capabilities, such as major weapons systems, intelligence access, the caliber and training of career personnel, the depth of trusted foreign relationships—all have lead times far in excess of a single presidential term. Many key appointments—such as Federal Reserve chairmen, FBI directors, and senior military appointments—are staggered to provide depoliticized continuity across administrations. Congress determines spending levels and allocations and can frustrate the president with policy riders and stalled confirmations even when the president’s political party is the majority. Moreover, the military; the foreign service; and the intelligence, economic, development, and law enforcement communities each have deeply entrenched and differing cultures and incentive structures that are difficult to affect from the White House. Yet most presidents think that because they are commander in chief, the interagency will be immediately responsive to their commands. This is only true if a president structures the process of policy formation to encourage institutional buy-in and then carefully supervises its subsequent execution—something few do. By far the more common practice is for a president to come into office without having much considered the optimal structure that balances the way he likes to receive information and make decisions with the legitimate institutional needs of the organizations he now leads. Presidents therefore fail to define the process clearly or demand that senior appointees abide by that prescribed process. As a result, they most often end up reflecting in their memoirs that they felt trapped by an ineffectual national security policy process that failed to produce a wider range of choices, was unresponsive to direction from above, and boxed them in by denying the time and range of choice they desired. Solving this problem begins with developing a solid understanding of the functional needs of the key national security agencies, especially the U.S. Department of State and the U.S. Department of Defense, or DOD. Some of these needs are common to all such institutions. For instance, large organizations such as State and DOD work best when they receive clear strategic direction from the White House that is itself the result of an inclusive and deliberative process. At the same time, each department and agency has its own cultural idiosyncrasies. To make a musical analogy, the military is like a symphony orchestra, and at its best, the foreign service can be like a jazz quartet. They both can sound beautiful. But while one is large, highly specialized, led formally, and follows a plan, the other is smaller, more flexible in its roles, led informally if at all, and rewards improvisation. An effective policymaking process recognizes these differences to meet the institutional needs of both communities simultaneously. Outside analysts—and those in the various departments—often critique White House micromanagement of the Cabinet. And these analysts are almost uniformly critical of instances when the national security advisor and the NSC staff have gone operational by undertaking execution of policy instead of restricting themselves to staff functions. Indeed, operationalizing policy execution in the White House has famously resulted in outcomes deeply damaging to presidents, whether by making tactical decisions on bombing targets in the Johnson administration or by running the Iran-Contra operations in the Reagan administration. As several interviewees stressed to us, the conventional wisdom that the NSC staff should not be operational really emerged from the Iran-Contra scandal experience. That it is diabolically difficult to tell who will prove successful in high-level interagency coordination jobs additionally clouds the process of making good choices. But there are characteristics common to people who have successful track records. They are committed to strong policy processes, instead of only to particular policy outcomes. They understand what level of authority is appropriate for different decisions to be made. They listen for departments’ concerns and craft integrated approaches as policy alternatives. They frame strategic decisions for Cabinet consideration and insist that the full range of strategic options be reviewed, not just the ones perceived to be preferred by the president. They use their authority to ensure implementation of decisions once made, review effectiveness, and propose adjustments as required. If part of the president’s campaign team, they have the rare discipline to be able to shift from campaigning to governing. If a president does select Cabinet members who have difficulty working effectively together or subordinating their activity to the president’s agenda, the role of national security advisor becomes especially important. As President Reagan’s last national security advisor, Colin Powell defused friction in the wake of Iran-Contra by emphasizing that he worked for the statutory Cabinet members of the NSC, not just the president. He thus held a brief in-person meeting in his office each morning with the secretaries of state and defense to ensure common focus. Bureaucratic rivalries are endemic to the interagency, inherent to departments with overlapping roles and responsibilities, and pre-exist any political personnel a president might appoint. This is why it is critically important that presidents select national security personnel who actively seek to minimize these rivalries, rather than those who exacerbate them. There is no substitute for candidates with deep experience in the executive branch, preferably across multiple agencies. Ideally, personnel decisions would be designed to create effective teams, both among the Cabinet and again within key sub-Cabinet subject area groupings. Very little will be accomplished if the relevant NSC senior director, assistant secretary of state, and assistant secretary of defense responsible for a specific issue area distrust each other personally and are unable to work together effectively. Politicians consider themselves effective communicators, for how can one be elected to national office without communicating effectively? Yet many, even most, presidents struggle to have their priorities understood within the federal bureaucracy and get the work of departments aligned to those priorities. And most do not consider how effective a specific candidate might be at internal communications when making Cabinet selections. In day-to-day management of national security, good communication allows policymakers to come into meetings having the same correct assumptions and to leave meetings with a common understanding of the next steps. Internal communication is driven by the model of interagency decision-making. The two foundational models of national security process are the Scowcroft and Kissinger models. Scowcroft is the exemplar of a neutral and transparent process of policy evaluation; Kissinger exemplifies an opaque and highly centralized policymaking process with the national security advisor as the president’s confidant and policy surrogate. Both models rely on principals making strategic-level decisions and departments empowered to execute policy. In practice, the Kissinger model often leeches so much information and responsibility away from departments that confused policy execution can easily be the result. It can also lead to a more activist Congress, urged on by departments and individuals uncertain about or opposed to policies they did not have a hand in crafting. The same logic applies to re-litigating policy decisions in the media: Incentives increase for working outside the system when the system is not perceived to incorporate departments’ concerns. Secretary George Shultz pointed out to us that lengthy confirmation processes also push decisions to the White House early in the course of an administration, which can become a set pattern if not consciously pushed back on as departments are staffed. In recent years, it has become more common for tactical-level decisions to be directed by the president’s staff in the White House. This may partly be driven by the revolution of instantaneous communications that make confidentiality more difficult and immediate reaction seem urgent, as many recent senior policymakers explained to us. It is also partly driven by the burgeoning size of the NSC staff, particularly after incorporating the enlarged Homeland Security Council. At its high point, the total number of staff members was reported to be more than 400 people, vastly larger than it was a generation ago.7 The number of people currently reporting to the homeland security and counterterrorism advisor alone is roughly the same as the size of entire NSC staff that worked for Zbigniew Brzezinski or Brent Scowcroft only one generation ago.8 Talented people armed with the president’s mandate are seldom passive in the conduct of their work, so they find problems to solve—even if it is not their proper role to do so. There is widespread consensus that this number got too high, and most recently, under National Security Advisor Susan Rice, the staff has undergone a deliberative process of reductions, coming down 13 percent to date. Richard Clarke, who served on the NSC staffs of Presidents George H.W. Bush, Bill Clinton, and George W. Bush, describes the Brent Scowcroft NSC as ruthless in policing the interagency. Deputy National Security Advisor Robert Gates would have NSC staff draft brief memoranda outlining options and identifying departmental positions on the issue for decision. In the Deputies Committee, Gates would ask participants to affirm that the strategic options outlined in the discussion papers accurately reflected their departments’ positions. If the papers did not, either the NSC staffers who drafted them or the department staffers who provided the input would be managed appropriately. Meetings were designed to force decisions at the lowest possible level rather than routinely push decisions to the highest level. Scowcroft himself described the process as “if they were at loggerheads, Gates simply had to say, ‘Well, let me talk to the president and see how things work out.’ You only had to do that once for people to understand how things ran.”13 Because Scowcroft was empowered by President Bush to run the process this way, no one doubted the NSC was the guardian of an efficient process that produced a maximum of agency participation in and clarity about decisions. As Daalder emphasized to us, “One of the reasons Gates and Scowcroft are effective is because the whole system was effective.” Owning the process also means clearly defining for all senior staff at the beginning of the administration the acceptable and unacceptable behaviors of NSC principals and the NSC staff. Presidents typically use their first issued directive to outline the interagency process but do not enforce its practice. Former NSC Senior Director for Defense Frank Miller attributed much of the difficulty in the first George W. Bush administration to Cabinet secretaries not considering themselves subservient to the president. The president owning the process is also important for managing the external relationships essential to national security policy. Hadley illustrates the difference by describing to the authors President Bush’s consultations with Congress about the 2003 invasion of Iraq and the 2006 decision to change strategy and surge forces in Iraq. In the first instance, President Bush left description of his strategy to national security advisor Condoleezza Rice, which Congress took as distancing himself from the approach. In the second instance, the national security advisor was present but not a participant in the consultation and the president himself explained his strategy and the force requirements, which Hadley felt was essential in garnering congressional support. Because there are a range of successful models for organizing national security policymaking and execution, and the choices about organization and personnel appointments need to be specific to the president in order to work effectively, the authors pose below a series of questions for consideration. The process of deliberating on the questions will assist the new president and his transition team in making appointments and establishing processes that work effectively for him. What are the circumstances that give the president a high level of comfort in evaluating options and making decisions? Some presidents prefer the lonely weight of solitary decisions; others are almost prime ministerial in their desire for consensus. Some prefer to talk through evaluations, while others absorb information and argument better by reading. Some prefer formal and inclusive meetings that generate multiple ideas coupled with smaller, informal groups to weigh options and make decisions. Some prefer to deliberate in private and communicate decisions after the fact. Structuring a process that makes it harder for the president to think his way through to weighty decisions serves him poorly. Matching the process to the president’s actual proclivities may be the most important national security decision of the administration. What role does the president want the Cabinet to have in strategic decisions: consultative, deliberative, or decision-making? This is a decision only the president can make, but it is important for the transition team or the national security advisor to have a conversation that allows the president to honestly and confidentially assign roles to the Cabinet that will facilitate rather than aggravate his decision-making. President George W. Bush seems to have envisioned himself in the Reagan mode of encouraging active dissent among the Cabinet, yet he was most comfortable making decisions when the Cabinet had reached consensus ahead of time. How does the president manage conflict among senior staff? Some presidents prefer outright disagreement among their Cabinet. Even when that approach suits the president, it is often injurious to smooth functioning of national security policy because of resentment among the Cabinet. Elliott Abrams, who held foreign policy positions under President Reagan and President George W. Bush, told us of Reagan holding repeated Cabinet meetings on whether to intervene in Panama, not because he was debating the policy merits but because he was managing disagreement between Vice President George H.W. Bush and Secretary of State Shultz. Does the president see value in doing this work himself or prefer to have the chief of staff or national security advisor smooth feathers and ensure teamwork among the Cabinet? How the president manages disagreement that will inevitably occur among his Cabinet will be a main driver for sustaining trust in the interagency. How much confidence does the president have in the judgment and managerial ability of the national security Cabinet members? This will affect both the autonomy national security Cabinet members are given and the role they have in deciding national security issues. It will also affect the interagency process, since, as former Homeland Security Advisor Frances Townsend emphasized to us, preparation by principals for meetings is highly determinant of outcome productivity. For the Scowcroft model to work, it requires high-order performance not only by the NSC staff but also by interagency principals and deputies. A high degree of confidence in management by others will allow downsizing of the NSC staff and the holding of fewer and more strategic meetings among deputies and principals. How will the president enforce decisions in the interagency? President Eisenhower used statement of conclusion documents as enforcement: If any Cabinet secretary disagreed with the NSC statement, the Cabinet would have to reconvene. President George W. Bush seemed to tolerate high levels of noncompliance by the secretaries of both state and defense in his first term, as well as to utilize stoplight charts for grading policy execution in his second term.14 Most other presidents fall somewhere in between these two approaches. Ensuring that departments accept a common understanding of decisions and carry out their respective responsibilities in policy execution is essential; determining feedback mechanisms and empowering enforcers are important actions for a president to establish early. How sensitive is the president to low-level bungling by departments? If very, then either senior appointees will need to have very close knowledge of the president’s objectives or the NSC will need to have line authority to execute policies or wide supervision over departments’ implementation. If the president has a higher tolerance for mistakes that are attributable to departments’ work, then the NSC can better serve the president by ensuring interagency debate on strategic issues. How will the White House protect the president’s need for confidentiality while deliberating? Loyalty of NSC staff is essential to having the president’s trust; this argues for a senior staff known to the president. Kissinger said that sensitive tasks migrated to him because the president trusted his confidentiality. From his vantage point close to President Obama throughout the past eight years, Ben Rhodes described to us instances in which the NSC staff identified issues as presidential opportunities and then created processes around them. Work will migrate to competent people trusted by the president no matter their official jobs and responsibilities; the best practice would be to place those trusted, competent people in the relevant statutory positions to begin with. In answering the preceding questions, transition teams can determine what types of organization and management of national security best suit the president’s own patterns of behavior, while still acknowledging the legitimate institutional needs of the bureaucracies that must execute the president’s decisions. The answers will help the White House establish the boundaries for the role of the National Security Council staff and its organization of interagency practices. Over the course of our interviews, we perceived a wide consensus on best practices across presidential administrations for producing sound policies and effective implementation that are offered below for consideration. To emphasize that the views presented are not the authors’ alone, we have included longer quotes on each subject from many whom we interviewed. Within a month of the election, the president-elect should meet with the person selected to be the next national security advisor to examine alternative models for national security decision-making, review best practices from previous administrations, and establish guidelines for the incoming administration. As soon as practicable during the transition, the president-elect and the next national security advisor should meet with those expected to be nominated as members of the Principals Committee and Deputies Committee to discuss those guidelines and establish clear expectations on processes. Soon after the inauguration, the new president should issue written guidance on process to all relevant departments. The next president and national security advisor should clearly define and communicate their vision for the preferred role of the advisor and his or her staff. It is important that Cabinet members, and by extension the thousands of people in their departments, have confidence that the national security advisor and staff will be honest brokers when differences emerge. Early on, the president should establish a regular battle rhythm of communication with the national security advisor. By modestly extending the time accorded to the in-person President’s Daily Brief on intelligence, for instance, the president will allow for a review of required national security decisions and upcoming Principals Committee and Deputies Committee meetings. Hadley described to us how he would come to see President Bush every day to let him know what was going on at the Principals Committee, for instance. If the next president decides, as some previous presidents have, to take the President’s Daily Brief in written form, then there should be a separate daily discussion scheduled with the national security advisor to meet this objective. Another question that should be defined upfront in the next administration is the degree of access that key Cabinet members will have to the president directly, outside of NSC meetings or staged public events. There are clear advantages to establishing routine patterns of meetings between the president and the secretaries of state and defense. Another one of the early rules of the road should define the mechanisms by which any domestic political concerns should or should not be incorporated in the national security policymaking process. There is clear consensus that political advice should come to the president outside of the formal national security policymaking process. At the same time, many whom we interviewed stressed that the communications strategies that drive global perceptions should be incorporated into national security policymaking. The distinction between incorporating a communications strategy and incorporating domestic political concerns is a narrow one, however. A clearly communicated policy from the outset of an administration on this issue will help avoid the risk of misperceptions down the road within the agencies about perceived politicization of national security policymaking. There is consensus among those interviewed that the next president should maintain the fundamental decision-making structure that has served the office well since the end of the Reagan administration: NSC meetings, Principals Committee meetings, and Deputies Committee meetings, all informed by thorough analysis and structuring by subject-specific interagency working groups, known by different names and initials in each administration but most recently as interagency policy committees, or IPCs. Not all interagency meetings are for the same purpose. It is important from the outset to distinguish between the three types of interagency meetings at every level: policymaking; implementation oversight; and crisis management. There is widespread agreement among our interviewees that formal meetings to establish national security policy at the principals’ or deputies’ level should be well-organized in advance, limited in instance and duration, and decisional in outcome. They should choose between well-defined strategic options and not be used for general information exchange or unstructured discussion. Formal meetings should be held to decide on the preferred national strategy for the issue at hand, which necessarily includes interrelated but distinct decisions about ends, ways, and means, while providing guidance on acceptable risk thresholds and defining appropriate interim goals and objectives. One of the common themes that emerged from our interviews was that to best ensure that options are fully explored and well-defined, deputies should insist on far more interagency work being done at the assistant secretary level before discussions take place at higher levels. One of the ways that such discipline breaks down is if a perception builds throughout an administration that the policymaking process at lower levels is irrelevant. This can happen if there are major disconnects between the discussions at different levels or if there is a widespread view that NSC staff members are not acting as honest brokers between agencies. In such circumstances, departments often “lean back” and refrain from active participation, much to the dismay of the White House. Our interviewees had a great deal to say about the important distinction between the execution of national security policies—something that the NSC staff should largely refrain from, except in very narrow circumstances—and the structured oversight of departmental implementation—a legitimate role for the NSC staff to lead. But even that oversight function can be controversial if it extends beyond the operational level and into the tactical level, whether that be clearing diplomatic cables or approving bombing targets. These lines are fine ones, however, and different individuals—and institutions—might prefer to draw them at different places and perhaps also for different subjects. This can easily lead to accusations of White House micromanagement, a criticism that has been lobbed at every modern NSC staff but has become especially common more recently. The solution is for the president to be clear at the outset of the administration on how he sees the proper role for the NSC staff in the oversight of the execution of presidential policies. Specific examples offered of NSC staff operating outside their lane include conducting routine diplomacy with foreign interlocutors, tactically directing covert or military operations, and personally communicating with operators in the field. For the vast majority of cross-cutting issues, the primary responsibility to lead the implementation of policy decisions across the interagency should be given to a lead agency and a specifically designated official, most often the State Department in the person of the relevant regional or functional assistant secretary. For country-specific implementation, best practice is to delegate the management of interagency execution to the chief of mission. Because other agencies have at times been reluctant to take direction from the State Department, even on matters of strict implementation rather than fundamental policymaking, a key role for the relevant NSC senior director is therefore to consistently reinforce the authority of the designated lead across the interagency. Working groups chaired by the relevant NSC senior director routinely engage in crisis management on issues that do not have the potential to affect vital U.S. national interests. But for those with the potential to have such effects, best practice is to have the Deputies Committee play this role. The first purpose of these meetings is to share information. The Deputies Committee should therefore err on the side of inclusivity so that every potential agency, subordinate organization, or field office can provide what it knows. The second purpose of these meetings is to make quick decisions as required, even if information is incomplete, and give clear guidance to the departments and the working-level IPC on the range of options subject to further quick, formal review. The third purpose of these meetings is to manage the public narrative about the crisis and the United States’ role in addressing it. Given the requirements for the principals and deputies to conduct formal meetings to make policy, oversee its implementation, and respond to crises, there can be understandable pressure to schedule a large number of such meetings. Nevertheless, one of the most strongly expressed opinions by virtually all our interviewees was that the number of these meetings has increased significantly during the past two administrations, which has not served either president well. The most valuable resource for the executive branch is the finite time of the senior-most members of the administration: the president; the principals; and the deputies. Moreover, the unrelenting demands on the time of these senior officials also come from their need to personally execute and oversee key policy implementation while more generally managing their own departments and agencies, some of which exceed the size and complexity of Fortune 100 companies. Most of those interviewed for this report shared the view that a goal should be for formal Deputies Committee meetings to occur no more than three times per week and for formal Principals Committee meetings to take place no more than once per week. 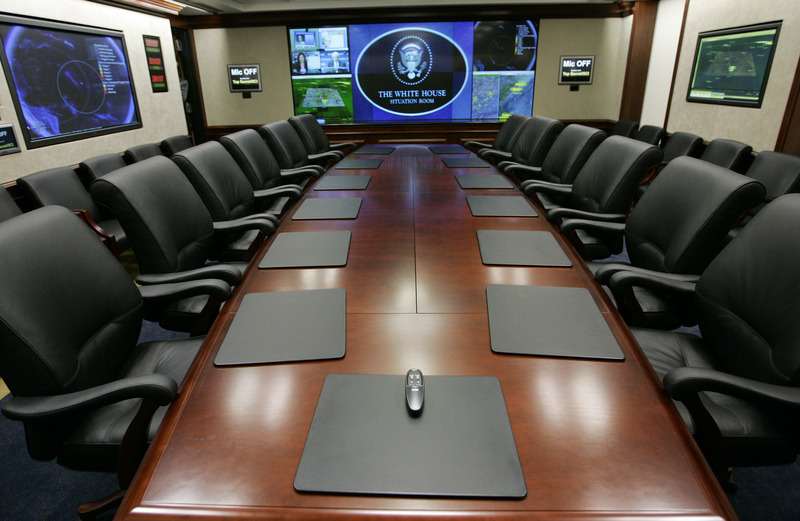 Formal National Security Council meetings should take place as needed but typically once every two or three weeks under the normal press of business. Many interviewees noted that the past two administrations both routinely exceeded this rate. Best practice is for the formal schedule of anticipated Principals and Deputies Committee meetings to be drawn up and continuously updated, distributed to the departments and agencies and to extend out at least one month, preferably longer. When Principals or Deputies Committee meetings are scheduled significantly more often than best practices would allow, the predictable result is that the meetings are often not properly structured; the officials at the table are not properly prepared; and the discussion is not well-focused or in the end decisional. Moreover, contributing directly to all of the above, the rank of the participants at these meetings often degrades to those unable to speak authoritatively for their departments. The new media environment can contribute to the pressure to hold meetings more often. As Ben Rhodes described to us, “A reality that any administration is going to have to wrestle with is that the media environment is so much more aggressive. … There is no discipline that is going to change that.” This new media environment brings information to the awareness of top policymakers much faster than before, provokes domestic and international audiences in ways that can be destabilizing, and makes it much more difficult to conduct U.S. diplomacy and military operations without leaks. Ad hoc informal communication mechanisms allow NSC staff to better manage the formal interagency meetings by clarifying department positions in advance and to ensure that they reflect the views of the principals. Beyond noting the utility of ad hoc communications, our interviewees also stressed the importance of developing a structure of informal meetings that operates alongside the formal national security policymaking system. Administrations have repeatedly discovered the utility of having a parallel series of informal meetings and discussions at each level of interagency decision-making, designed to identify issues, set agendas, exchange information, coordinate plans, and resolve implementation issues. One of the advantages of these informal settings is that senior officials can express views that might differ from the institutional positions of their departments. While policy issues are working their way through the formal and informal processes, the national security advisor’s responsibility is to keep the president informed. In soliciting the president’s views informally, a delicate balance should be struck between ensuring that the process fully explores all relevant options and that it does not waste time producing recommendations that will be contrary to the president’s strongly held preferences. Those interviewed stressed the importance of the quality and timeliness of the background papers that the NSC staff distributed in advance of Deputies and Principals Committee meetings. Unfortunately, many complained that these materials regularly arrived too late. A best practice is for background papers to be distributed to participants one week before a scheduled meeting. This allows each department the time required to circulate the papers to all relevant headquarters and field offices, to assess whether its preferences have been appropriately incorporated into the papers, to resolve any remaining differences of opinion within the department, and to draft and clear department-specific preparatory materials for the principal or deputy. This background paper should be drafted by the lead senior director on the NSC staff, with appropriate guidance from deputies or principals. It should clearly define the full range of potential mutually exclusive strategic options and identify department preferences for each option. Department representatives at formal interagency meetings must be in a position to speak authoritatively for their agency. Principals should provide guidance to their deputies before every Deputies Committee meeting. Deputies should provide departmental guidance to their assistant secretaries while the interagency working group processes are underway. Indeed, many whom we interviewed expressed similar complaints regarding the perceived lack of internal coordination within national security departments and agencies. For the vast majority of meetings, only principals should sit at the table in Principals Committee meetings and only deputies should represent their departments in Deputies Committee meetings. Only in rare exceptions should subordinates be allowed to participate in lieu of their superior. It is best practice for the principal or deputy to be allowed a single “plus one” to sit in the back row—unless the subject at hand is particularly sensitive. These backbenchers typically led the policymaking process for their departments during the interagency policy committee process, so they are in a position to provide expertise when asked, though their primary role at the Deputies Committee or Principals Committee meetings is that of a note taker and internal back-briefer. However, concerns about the perceived proliferation of backbenchers, often people unknown to those at the table, were also expressed by many of those interviewed. Similarly, the national security advisor and deputy national security advisor should allow themselves only one plus one rather than the especially large number of NSC and White House staffers who would otherwise seek to sit in on the meeting. Our interviewees felt that in-person meetings are always preferable to participation by secure video conference, or VTC, and having fewer meetings overall would encourage officials to participate in person whenever possible. Those who chair interagency meetings should take care when inviting field officials to participate in Principals or Deputies Committee meetings via video conference that the multitude of additional voices does not result in a less efficient conversation. The chair should ensure that meetings held at these senior levels start and end on time. While perhaps an obvious point, many interviewees described it as a consistent source of frustration in each of the past two administrations. To improve time management, the portion of the Deputies or Principals Committee meeting accorded for intelligence briefings should be limited. Instead, participants should have been briefed on this material by their own agencies prior to the meeting. Consensus is a desirable outcome but not required. Too much of an emphasis on consensus risks leading to language that papers over disagreements instead of highlighting them for higher-level consideration and adjudication. Everyone interviewed for this report stressed the importance of the official summaries of conclusion, or SOCs. As Frank Wisner told us, “You need to make sure that summaries of conclusions are done quickly and accurately. It has to be absolutely clear because with national security matters, people’s lives are at risk.” A best practice, therefore, would be that in addition to the chair reviewing the conclusions verbally at the end of the meeting, a written summary of conclusion should be distributed within 24 hours. To expedite this process, it is recommended that the relevant NSC senior director produce a draft of the summary of conclusion in advance. Indeed, several interviewees commented on the need to ensure that these summaries sometimes needed to be corrected. There is debate, however, on how much descriptive information should be included in the formal summaries of conclusion. When issues require an in-person NSC meeting, many who we interviewed argued that the president should consider holding back his final decision during the meeting in order to continue his own personal deliberations. Doing so also provides an opportunity to manage the narrative as the new policy is rolled out. In order for the NSC staff to play the optimal role described above, the national security advisor should structure time for internal discussions with the NSC staff to encourage information sharing across directorates and drive strategic planning. As alluded to by Frank Miller above, our interviewees expressed widespread concerns about the relatively recent, excessive layering of the NSC staff. The NSC staff has always had two tremendous comparative advantages when compared with the national security departments and agencies: its proximity to the president and its organizational flatness. The proliferation of deputy national security advisors and the layering of senior coordinators ranking above some senior directors have all contributed to the creeping bureaucratization of the NSC staff, diminishing the flat organizational structure that served previous presidents well. The consensus best practice, expressed often in our interviews, is for NSC senior directors to possess a personal stature that matches their positional stature. That is to say, if they are to lead work at the assistant secretary level, they would benefit from already having been an assistant secretary, ambassador, or the equivalent—or being widely perceived as being qualified to hold such a position. It is advantageous for senior directors to have previously worked in more than one department or agency. It is rare for a senior director to be successful in their role without having worked in government at all prior to joining the NSC staff. Federal departments should be encouraged to make their very best personnel available to serve on the NSC staff and then make superior positions available for them upon their return. Unfortunately, that often is not the case. Formal training on best practices in management, policymaking processes, and presidential support should be provided to incoming NSC senior directors and directors. The current Obama administration initiative to provide such formal training should be continued in the next administration. Our intention in undertaking this work has been to assist a new administration in making deliberate choices about how to structure the process of supporting the president on national security issues. We engaged with high-level practitioners of both parties and let their voices carry the recommendations of best practices for structuring and running the policy process. Our strong belief is that transition teams best serve the president by matching processes to the president’s own management style and advocating for senior appointments who will consider national security policymaking a team sport. As they design their internal processes, they should apply best practices drawn from the experiences of their predecessors. We hope this report will assist in the difficult and important work of transition. Kori Schake is a research fellow at the Hoover Institution. She is the editor, with Jim Mattis, of the book Warriors and Citizens: American Views of Our Military. She teaches “Thinking About War” at Stanford, is a columnist for Foreign Policy magazine, and is a contributor to “War on the Rocks.” Her history of the Anglo-American hegemonic transition is forthcoming from Harvard University Press in 2017. She has served in various policy roles, including on the National Security Council at the White House; in the Office of the Secretary and Joint Chiefs of Staff at the Department of Defense; and on the Policy Planning Staff at the State Department. During the 2008 presidential election, she was senior policy advisor on the McCain-Palin campaign. She has been profiled in publications ranging from national news to popular culture including the Los Angeles Times, Politico, and Vogue magazine. Her recent publications include: “Republican Foreign Policy After Trump” (Survival, Fall 2016) and “National Security Challenges for the Next President” (Orbis, Winter 2017). William F. Wechsler is a Senior Fellow at the Center for American Progress, where his work focuses on counterterrorism and U.S. national security policy in the Middle East, South Asia, and Africa. His most recent position in government was deputy assistant secretary of defense for special operations and combating terrorism. Prior to that, he served as deputy assistant secretary of defense for counternarcotics and global threats. During the Clinton administration, he served as special advisor to the secretary of the Treasury, director for transnational threats on the staff of the National Security Council, and special assistant to the chairman of the Joint Chiefs of Staff. He has contributed chapters to two edited volumes and has been published in The New York Times, Los Angeles Times, Foreign Affairs, and the National Interest. He is a graduate of Cornell University and received a master’s degree from Columbia University’s School of International and Public Affairs. The authors could not have written this report without the help of several research assistants from the Center for American Progress and the Hoover Institution, including Ayla Bitmouni; Christina Huchro; Shaun Kleber; Andrea Sarahi Zaldumbide; and especially, Sangita Kanumalla.